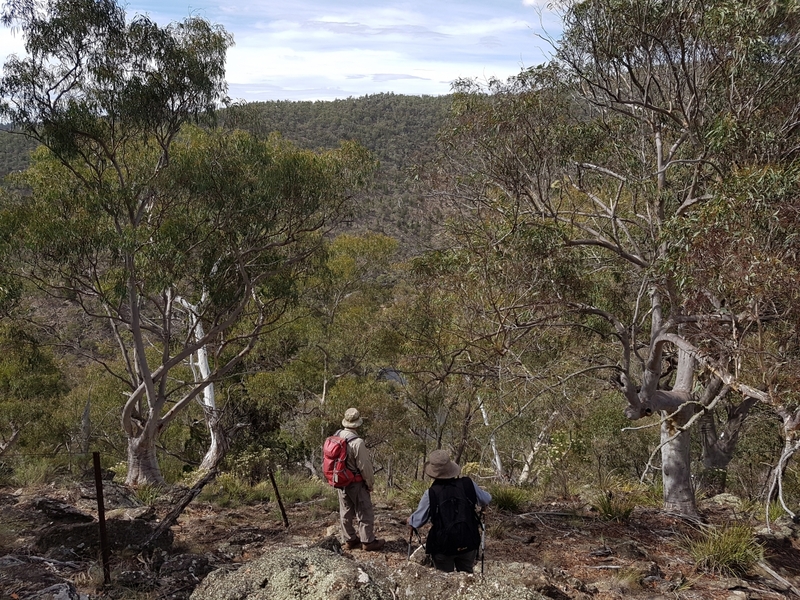 On 25 March, 2018 a six hour walk into the Murrumbidgee Gorge commenced and finished at Yalcowinna, 12 kms north of Cooma on the Shannons Flat Road. Five hikers enjoyed climbing three ridges to the east, each progressively higher until the final 300 metre decent into the rugged and untouched bush of the Binjura Nature Reserve. En-route to the picturesque river, we encountered a sleepy wombat, 1870’s survey marks and signs of the early settlers’ efforts to tame the bush, where they had ring barked the eucalypts long ago in their endeavours to grow more grass. Upon reaching the river a picnic lunch by the babbling water sustained the troops preparatory to hiking upstream, encountering two feral goats, as we made our way to the Black Snake Creek. Following this creek west avoided the huge climb out of the river gorge and took us back to the Yalcowinna homestead where afternoon tea awaited. In all it was a lovely day for a walk, and close to Cooma.